Dell India, today announced the launch of its latest campaign, just as the festive season kicks off. The campaign extends across television, print and digital with prime associations and a high impact creative approach. Key to the launch, is Dell India’s television commercial that introduces ‘Dell Cinema’ – the 2018 innovation announced at CES earlier this year and which is available across a range of XPS and Inspiron PCs. Addressing the young and upcoming digital affluent individuals, the TVC will air across leading 42 English and Hindi entertainment, movie and music and sport channels and in regional media across Tamil Nadu, Karnataka and Andhra Pradesh. Dell’s association with the upcoming ‘Thugs of Hindostan’ across YouTube and Facebook as primary digital channels and a presence during the Asia Cup Cricket Tournament, is aimed to engage with consumers throughout the festive period. The estimated reach of the campaign is 71 million. Festivals in India exude a common sentiment across all corners of the country – be it the joy of colourful scenes everywhere, striking visuals and the drama of colours or celebratory songs sung in unison. Dell Cinema technology with its CinemaStream, CinemaSound and CinemaColor features brings consumers closer to true entertainment, the way it was intended to be. The television commercial brings to life Dell’s commitment of redefining experiences that matter most to consumers. Be it films and their grandeur or memorable patriotism felt while watching a favourite sport together, Indians come together to celebrate, experiences. The film inspires consumers to enjoy a truly immersive cinematic experience, while transporting them to a completely new world, of extraordinary colour and sound. Conceptualized and executed by Grey group, the film depicts features of Dell Cinema that collectively offer an immersive cinematic experience to the user who can enter a world of life-like colour, resonant sound and uninterrupted streaming. The film begins with the viewer visually entering a vibrant festive dance that comes alive on XPS 13’s screen, followed by losing oneself in watching a graphics intensive film with feature rich audio, the effect of which is evident on a glass of water kept next to the laptop. The film concludes with fans in a cricket stadium cheering for India, with every little detail coming to life without interruption, thanks to the unmatched streaming experience. 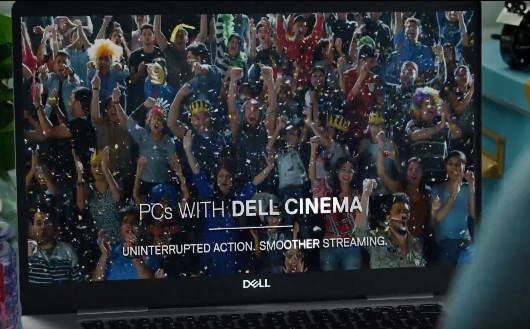 Commenting on the new TVC, Ritu Gupta, Director, Marketing – India & ANZ, Consumer & Small Business, Dell said, “Dell Cinema is an incredible innovation by Dell. It is the promise of entertainment being delivered in a way that it was designed to be by content creators – on your PC. We’re taking Dell Cinema closer to our consumers who look for immersive cinematic experiences, anytime and anywhere. The Indian festive season is as immersive as it can get and we are so excited to be a part of it with Dell Cinema”. According to Vishal Ahluwalia, Senior VP & Branch Head, GREY Bangalore; “Dell and Grey as a team have been fortunate to have unique & insightful winning executions across all festivals in the past. While Dell as a brand is immersed in the Indian culture, this year we decided to project the grandeur of India celebrating through myriad of passion best experienced on Dell Cinema. The TVC captures a plethora of passion, which we are unable to experience live due to our busy everyday life. Dell Cinema experience is akin to reliving the moment “LIVE” in best of sound, color and streaming”. The film went live on Dell’s social media channels on 12th September with the TV campaign going live from September 16 till November 7, 2018. GREY Group India unleashes shararat again for Britannia Cakes!